This time of year is my busy season, so I feel like a little bit of a crazy person right now. But, I wouldn't have it any other way! Being busy just means that I'm spending a lot of time working with my beautiful clients! Oh man, this is so so important! Are you a rustic, wedding-in-a-barn type of person? or have you always dreamed of an elegant, black-tie, wedding-in-a-mansion day? Whichever style fits you, you want that to be communicated in your wedding stationery. You work too hard on planning your big day for it to not go perfectly because of a few guests showing up wearing inappropriate attire. So, before doing anything, lock down your style! 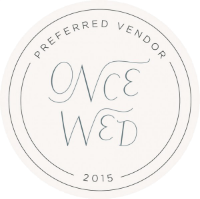 This is also very helpful when choosing the vendors you'd like to work with. If you know what look you're going for then you can find a photographer, stationer, florist who specializes in that style - then you can rest assured you'll be getting what you want. If you don't know where to start, a great place is to create a Pinterest board to brainstorm ideas on. This sort of goes hand in hand with choosing your style, but it can be super helpful to work your colors into your invitations. It's easy to overlook the fact that your colors are incorporated into everything, and they set the aesthetic tone for the day. They're also very helpful for all of your vendors (photographer, florist, caterer, coordinator) to work from. Also, side note, it's helpful if guests know what colors not to wear as you want you and your wedding party to stand out as much as possible! Explicit RSVP instructions (including deadline date), possible food restrictions, song requests. Catering details - buffet or plated dinner, alcohol policy, etc. Who is specifically invited? - which guests can bring dates? are kids welcome? etc. Additional details - Wedding website, where and when to find the hotel block, directions to and from the hotel, directions to the reception, parking details, pre-wedding and post-wedding brunches and get togethers, etc. As a designer in this industry, I know two things: 1.) There are endless possibilities to creating wedding stationery, and 2.) Money doesn't grow on trees. So, you have to figure out what wedding stationery is best for you and your budget and time frame. And I completely understand! You could choose to have everything from custom lettering on invitations, RSVP cards, and envelopes, and decorated interior envelops, to just having invitations addressed. It's up to you! You just have to ask yourself "How much time and money do I have to spend on this?" and "How much time and money do I want to spend on this?" The beauty is that there's no wrong answer. It's all about you! That's all for now, but fellow designers and brides, what else would you add to this list?